The holiday season is my favorite season! And it’s already in full-swing. This weekend I did a Rudolph Run 5K, baked Christmas cookies, and hosted a festive get-together with friends which involved ornament-making and eggnog-drinking. While the holidays are my favorite, they can definitely be hectic and draining. But I’ve got a cure for that: coffee. Ginger Molasses Cookies are one of the treats I bake every single year. I made them for the first time 6 years ago with my sister when we were both living in Florida and spending our first Christmas away from home. That year for Christmas we got Chinese food and went to the movies, but despite not having a traditional holiday, we wanted to start some traditions of our own. Which included baking cookies! Lots and lots of cookies that year, more than we could eat. 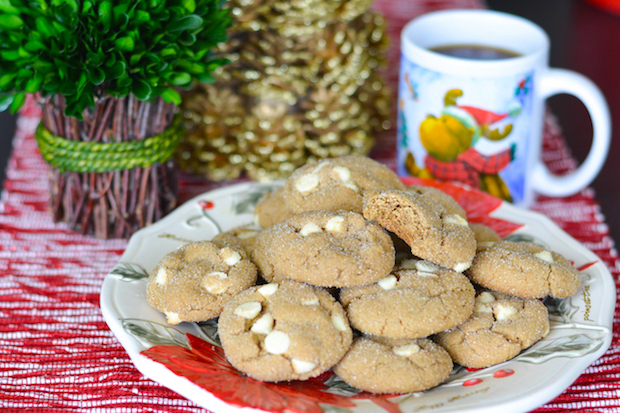 The Ginger Molasses Cookies were my favorite and I’ve made them every year since then. They’ve become one of our holiday traditions, and every time I make them I think of my sister and our warm, Florida Chinese food Christmas together. 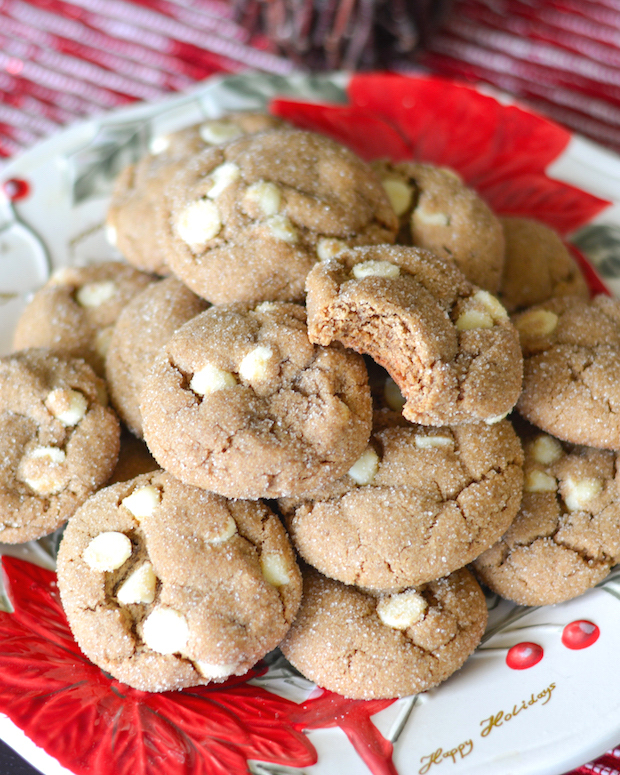 This year, I decided to mix it up a tiny bit and added some white chocolate to my cookies! I was feeling a little extra festive, and I think ginger and white chocolate is a great combo together. The result was an extra-sweet cookie. Which I think is just perfect to pair with a hot cup of coffee. Speaking of traditions, sometimes you just need a good, classic cup of coffee. Perhaps one that comes in a cute red can? 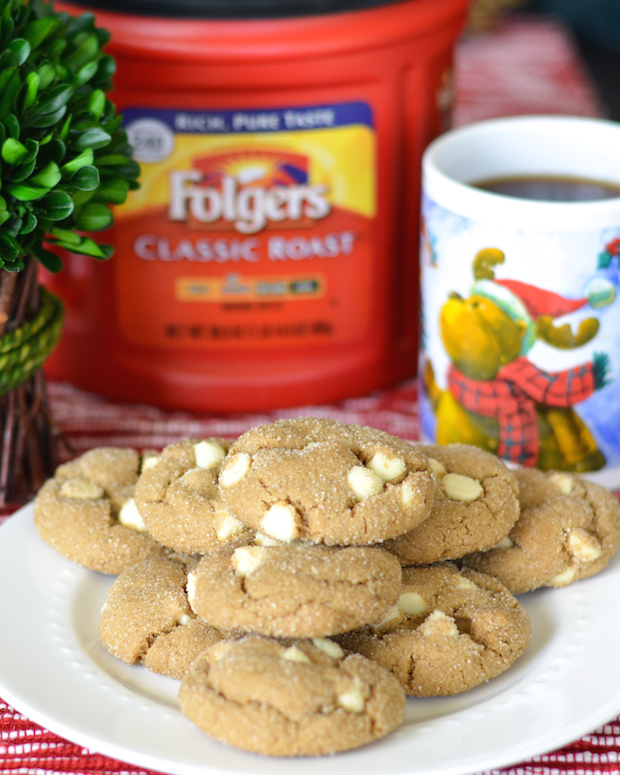 Folgers® Classic Roast has been around forever and is steeped in tradition, just like the holidays. It’s made from Mountain Grown® beans, the world’s richest and most aromatic. It’s been around for 150 years for a reason! It was the perfect with these sweet treats and it’s perfect for fueling you through the busy holiday season. Using an electric or stand mixer, cream butter and sugar together until light and fluffy. Beat in egg and molasses. In a large bowl, combine the flour, baking soda, spices and salt. Gradually add to the creamed mixture until well mixed. Add the white chocolate chips and mix on low for just a few seconds, until the chips are distributed. Roll into 1½ inch balls, then roll in sugar. Place 2 inches apart on ungreased baking sheets. Bake for 10-12 minutes or until puffy and lightly browned. Remove to wire racks to cool. How do you get through the busy holiday season? What’s your favorite holiday treat or tradition? These cookies look amazing, Jess! 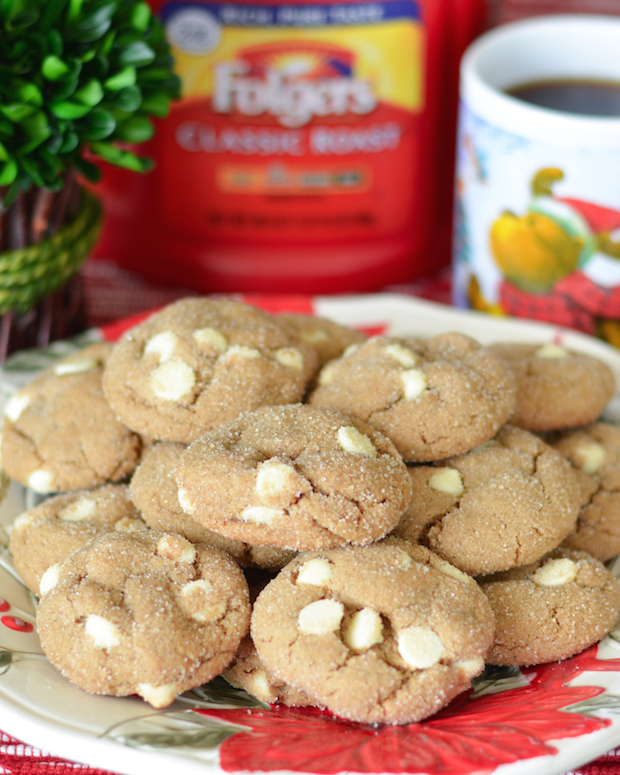 I love all the warm fall flavors, and I adore the white chocolate!! These cookies look so soft, Jess! Love that you added white chocolate in them too. One or two of these would definitely be perfect with some coffee too! Oh, I like these, never saw them before, they look like a great comfort cookie. They are definitely my favorite! Thanks, Amy! Sounds like you had a great weekend, Jess! I did two holiday 5ks a few years ago and it was a blast! But I’m so out of shape to do that now! 🙂 I’m loving the combination of white chocolate and molasses, Jess! These cookies looks SO good. Wish I had one for breakfast! Jess these look so darn good!